The LDI OTAL Classic IR Laser Pointer from US Night Vision is a rugged compact 1mW laser pointer and target designator. It is constructed from anodized aircraft aluminum, submersible to three meters, and features adjustable windage and elevation, making this pointer a dependable battle-ready aiming laser. This model of the LDI OTAL is configured with a one-milliwatt beam that is visible with night vision to a range of 600 meters, ideal for short and mid-range tasks in daylight and no light. The laser mounts behind the front sight of M-4 rifles without obscuring the operator's view or adding excess weight to the weapon barrel. 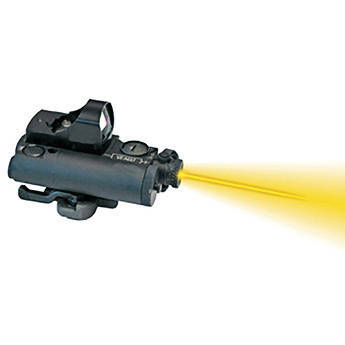 Additionally, this low-profile laser device accommodates scopes, holographic sights, and night vision devices. Constructed from 6061T-6 anodized aluminum and submersible to 10 feet / 3m, this pointer is a dependable battle-ready laser aiming device. This version of the OTAL is configured with a 1mw 835nm infrared beam that is visible with night vision to a range of 656 yd / 600m, ideal for short and mid-range tasks in daylight and no light. A low profile design allows the laser to be easily mounted with included quick release mount on M-4 style rifles in front of scopes, holographic sights, and night vision devices.